As children, the first cities we build are often rendered in Lego. Artist Ben Hecht uses the material in a slightly different way—to recreate cities as giant Lego brick paintings inspired by satellite imagery taken from above. Creating the series, named Urbicus, is quite an involved process. First, Hecht snaps an aerial photo with his DJI Inspire 1 quadcopter to give him the lay of the land. Then he recreates the urban tableaux below in Lego bricks, computer parts, and disassembled circuit boards. 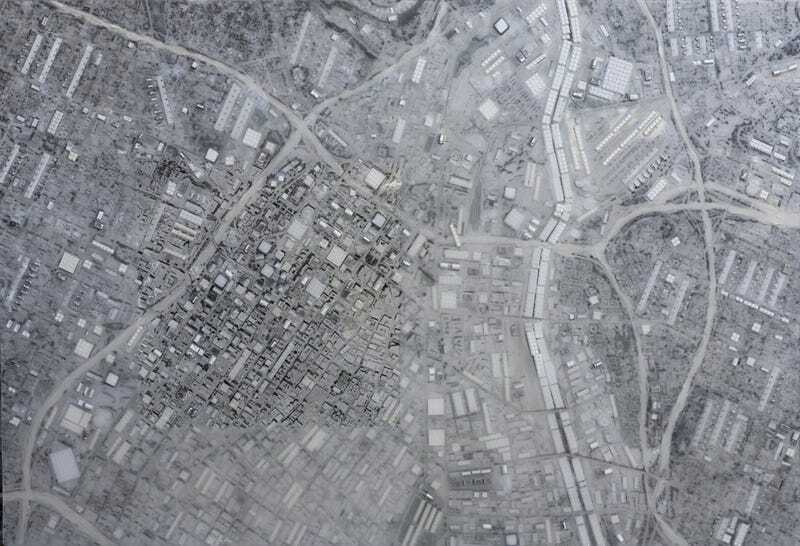 To hold the pieces in place, Hecht then smothers the pieces in resin, which adds a flatness to the painting that evokes our screen-based relationship with maps. The result is almost like a 3D Google Earth rendering, with each piece adding the perfect authentic texture for the cityscape. So far Hecht has trained his drone on Miami, San Diego, Los Angeles, Houston, New York, and Seattle, and is looking to DC and Boston next. His latest creations are currently on view in Los Angeles and Miami. Next up? A Lego version of Apple’s new campus in Cupertino.